The Kansas City region added jobs for the third consecutive month in July. 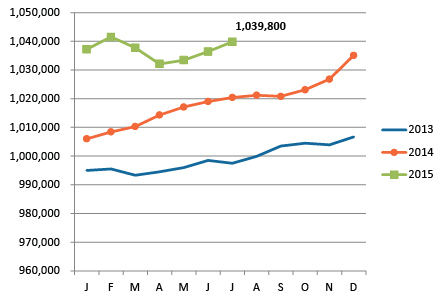 Employment now stands at 1,039,800, which is nearing the all-time high we achieved in February. 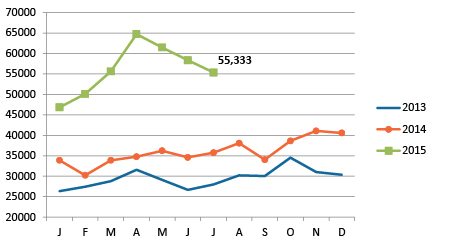 Overall, the metro is up by 19,400 jobs from one year ago. The financial sector saw the biggest increase, adding 4,200 jobs, followed by professional business services (3,700) and local government (which includes public schools) at 3,600. The metro unemployment rate ticked up slightly to 5.5 percent — still significantly lower than the rate one year ago, but higher than most of our peers. While the regional workforce is steadily plugging away this summer, there is some exciting research going on behind the scenes. We have been working with the Council for Adult Learning and Experiential Learning (CAEL) on a detailed inventory of our regional educational assets. Through this analysis we will be better able to identify gaps between local education offerings and education required by employers. On a related, but more granular scale, we have also been analyzing competencies (knowledge, skills and abilities) required for jobs in several of our key industries. This study will help us identify key competencies needed in our growing industry sectors at a more detailed level. And finally, we are listening to businesses through facilitated discussions to identify persistent shortfalls in our regional workforce. Work on each of these research projects is ongoing. Watch for detailed updates at our upcoming Workforce Summit on November 3. Regional employment grew for the third month in a row in July and is nearing the 1,040,000 mark. 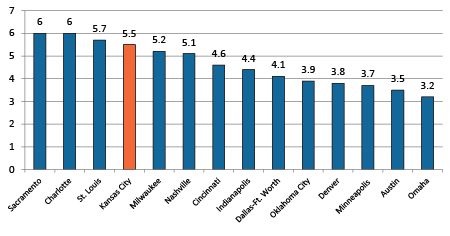 Kansas City's unemployment rate jumped a bit in July, to 5.5 percent. NOTE: We typically use the seasonally adjusted unemployment rates here, but that data series is temporarily unavailable. The rates shown below are not seasonally adjusted. 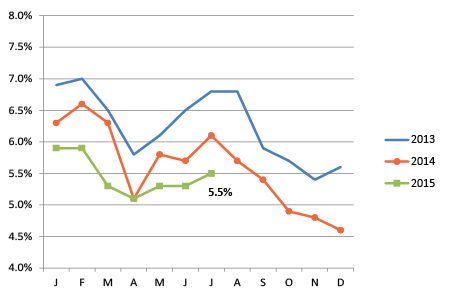 Unique want ads have dipped since April but they remain well above last year's numbers.